If there's one thing London does well, it's booze with views. 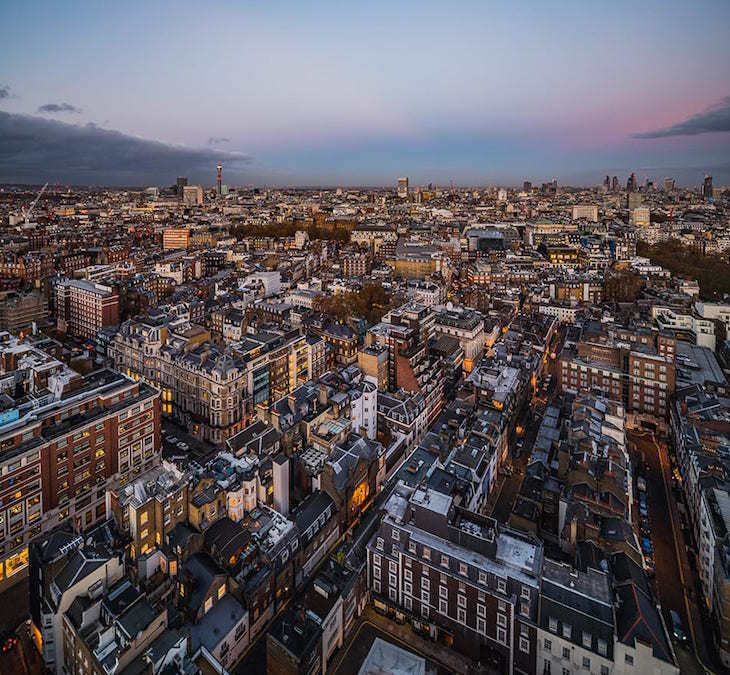 We've already covered the capital's rooftop bars in detail so we've ignored those here, and focused on London's other bars with a view — you know, the ones where the elements are irrelevant, and you can enjoy the views whatever the weather. The tallest building in the UK is an obvious one to scale if it's views you're after — and provided your wallet is deep enough, The Shard won't disappoint. Let's start at the top; Gōng, part of the Shangri La Hotel, is located on level 52 and claims to be the highest hotel bar in Europe, with views to the west, north and east (note, it's still not as high as tourist viewing platform View From The Shard, which gives you access to levels 69-72 and offers 360 degree panoramas). Pick from the Champagne Bar, Cocktail Bar or Sky Pool areas, and get stuck into your poison. 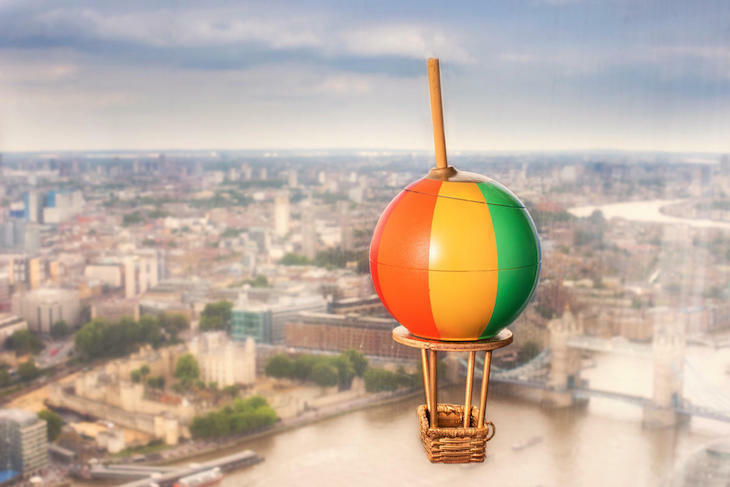 Some serious thought has gone into the cocktail menu, with each tipple designed around a useful invention — tractors, screwdrivers and a compass are all represented, but the highlight, particularly for photos, is Over The Rainbow, an homage to the hot air balloon, served in a hot air balloon. Frame your shot right to capture it sailing over the London skyline below. 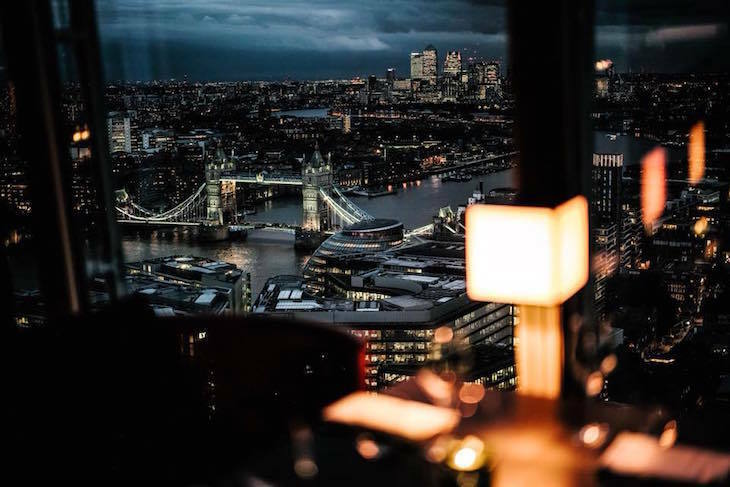 Down at level 31, Oblix is split into fancy restaurant Oblix West, and the more booze-focused Oblix East, which offers views towards Tower Bridge and Canary Wharf. The cocktail menu is heavily infused with Johnnie Walker whiskies mixed with unusual ingredients including seaweed, shortbread and popcorn (not all in the same serve, thankfully). Other cocktails are twists on the classics — rhubarb & bubblegum martini anyone, or how about a banana old fashioned? The spirits menu is impressively extensive and the bar snacks are very reasonably priced for the setting. A final entry for Renzo Piano's masterpiece — although still rather high by an average building's standards — is level 31's Aqua Shard. First things first: there's a £50 minimum spend per person at the bar, so don't be planning on swooping by for a quick cocktail and a snap for the 'Gram before beating a hasty retreat. If you're here, you're here for the night. The wine list runs to several pages, with bottles from all over the world, and prices starting at around a tenner a glass. Of course, prices go much further skywards if you're looking to splash the cash. If it's cocktails you're after, we'd recommend trying something from the Pop From The Past menu, all of which use the classic British ingredients of gin and tea, served as a lightly carbonated bottled drink as a nod to the first ever 'bottled cocktails'. Due to its cluster of skyscrapers, the City of London is home to a fair few sky-high watering holes. 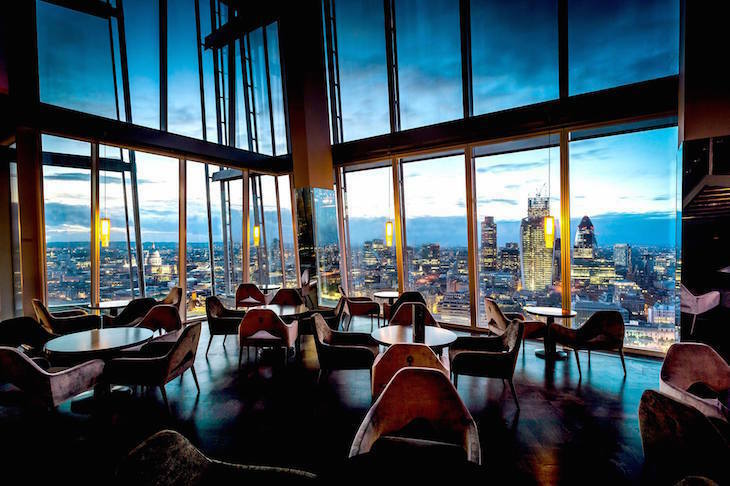 The Heron Tower hosts two venues which mainly function as restaurants but have a decent bar menu too. Duck & Waffle on level 40 is famously open 24 hours a day, meaning you can imbibe everything from your early morning coffee through to late night cocktails at that 24-seat bar (for a lazy and pricey bar crawl, install yourself for a whole day, occupying each seat for an hour at a time). Rest assured that whatever time you visit, at least one of the food menus will be available, so you can soak up the views with the likes of bbq-smoked crispy pig ears, smoked eel croquettes, and the famous spiced duck doughnut. A couple of floors down, Japanese-Peruvian-Brazilian fusion restaurant Sushi Samba proffers a hefty 'Beverage Book' to those in need of a drink, largely dominated by Japanese sake, Brazilian cachaça and Peruvian pisco. 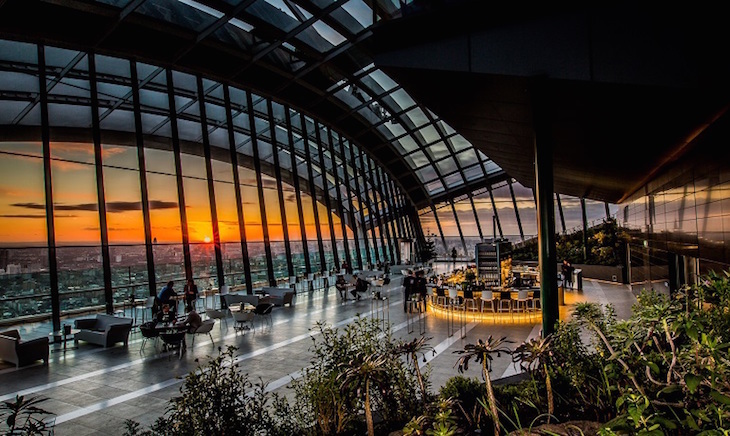 Sure, you could visit London's Sky Garden for free and release your inner tourist. Or, you could book yourself a table at the Sky Pod Bar like a Londoner. All the classic cocktails are available, along with a seasonally-changing menu of other serves, including warm cocktails in the winter. The Shard may be higher, but in our opinion, you get better views of the river from over here. 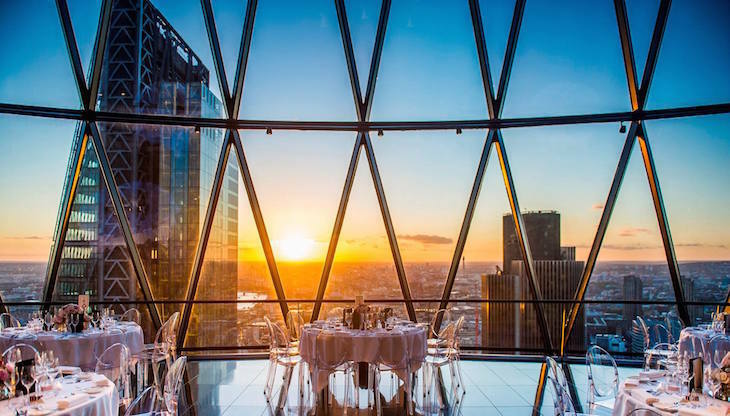 Until 2018, views from the top of The Gherkin were only for those frequenting the private members' bar. But now, restaurant Helix and bar Iris are open to all, with no membership required. 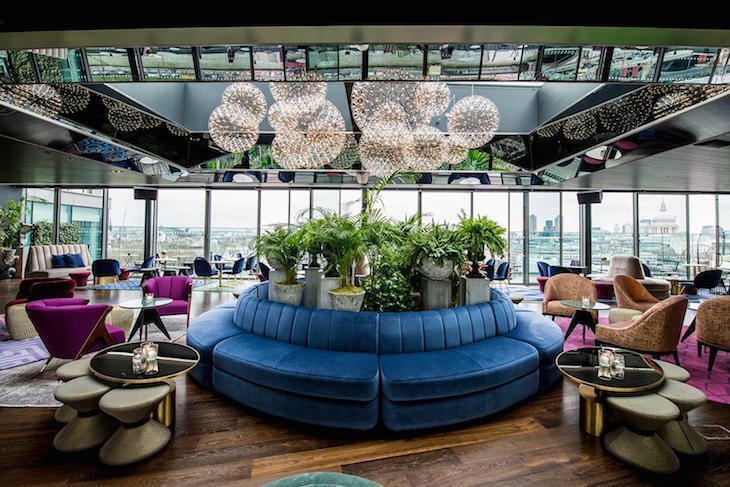 Iris, is located on level 40 — cast your eyes to the ceiling and you'll find yourself right below that iconic Iris-shaped dome which gives the bar its name. 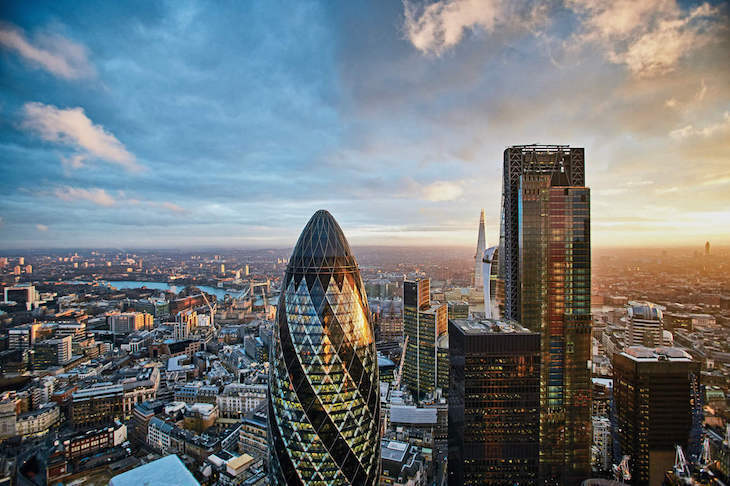 The views here really are 360 degrees, with floor to ceiling glass, but we recommend visiting soon — as more and more new skyscrapers cluster around The Gherkin, views from within it are becoming restricted. 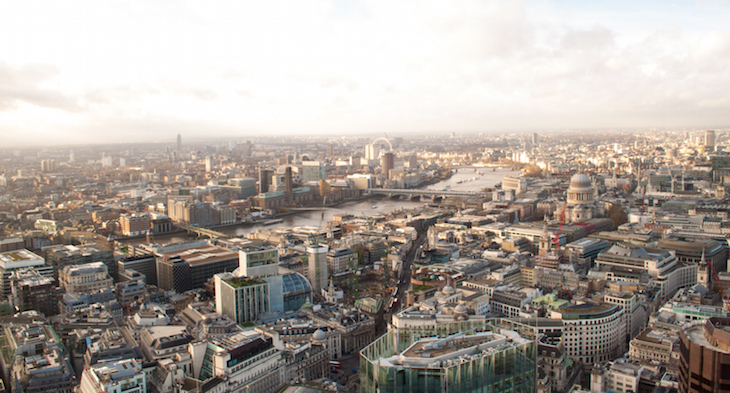 Vertigo 42 has the honour of being London's highest champagne bar (and once a year, it's the finish line for Vertical Rush, a charity run up the staircase of Tower 42). 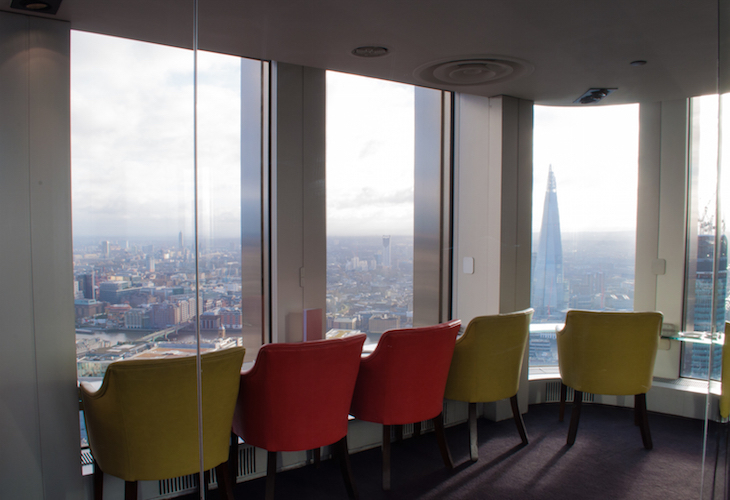 Once upon a time, Tower 42 was the tallest building in the Square Mile, but as new-builds have dwarfed it, the crowds have fallen away, making this an excellent option for an exclusive date night. Although focus is on champagne, wine and cocktails are available too, and there's even a tapas-style food menu to be enjoyed while perched on a bar stool or cosied up in a leather armchair at the outwards facing bar. Views to the south-west round to the north are best here. Oh, and a word of warning — look out for the wall of mirrors, particularly when you're a few drinks in. It's reservations only, so book before you go, and there's a minimum spend of £15 per person. Where there are skyscrapers, there are sky bars, so head east to Canary Wharf's 48th floor, family-run Capeesh. 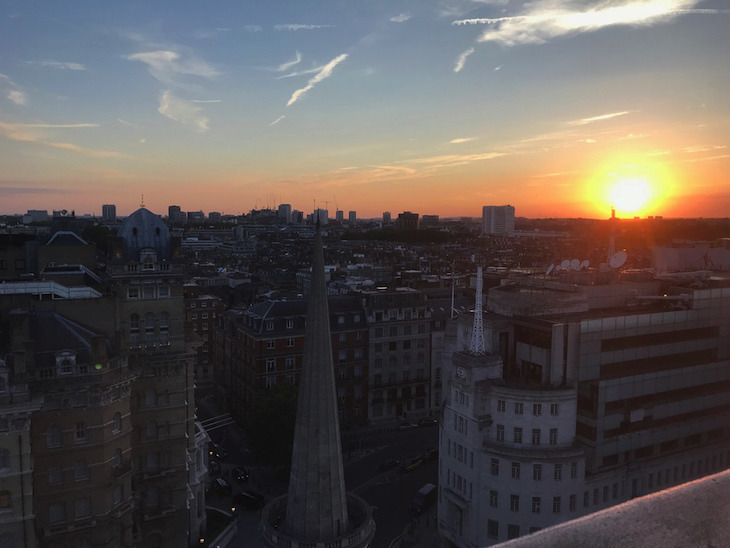 Italian food is the speciality in the restaurant, and while the lounge bar is ideal for a chilled out catch-up, it's the lively Sky Bar you want for the views. As city suits work all hours in the surrounding skyscrapers, look across — or even down — at them and the river beyond, while tucking into cocktails and canapes or a glass of vino. There's a live DJ every Friday, and club nights on Saturdays. 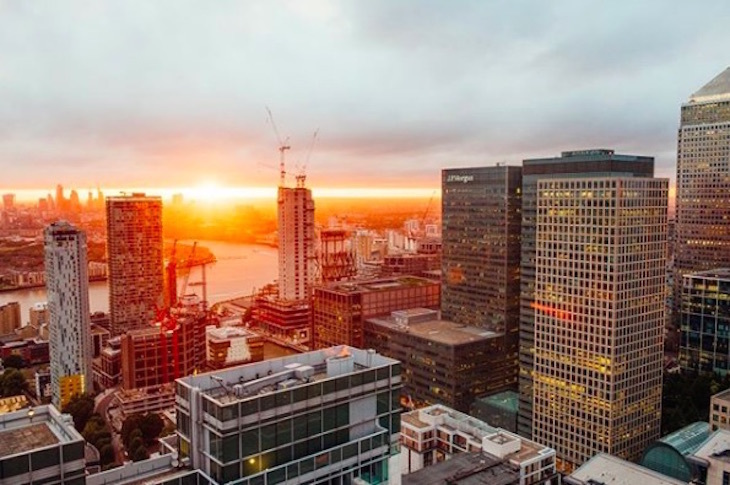 You don't even need to leave your house — nay, your chair — to experience Bōkan's impressive views thanks to this highly addictive 24 hour live webcam, broadcasting the views from the 38th floor Canary Wharf bar, atop the Novotel London hotel. But the real thing is infinitely better, so we recommend getting dressed and heading east. The industrial chic bar rocks floor to ceiling windows, and is as big on craft beer as it is on fancy cocktails and fine wines. Sharing platters and starter-style dishes are available to order, and the cocktail menu takes inspiration from the bar's Docklands setting, with Chaos On The River (Campari, Orgeat and Lemon) heading up the West India Docks section, while The Dark Whale (Kraken Spice Rum, Amaro d’Angostura, Lime, Mandarin, Mint, Ginger Beer), flies the flag for East India Docks' whaling history. 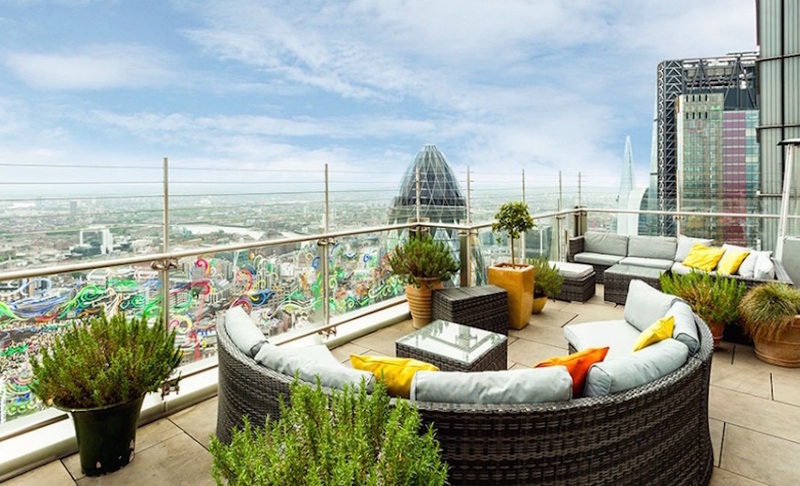 Such is the allure of Sky Bar London that the team offers a special Proposal In The Sky package. If you're not quite there in your relationship yet, you'll need to make a booking for cocktail in the sky (or afternoon tea in the sky) to gain access to the riverside views. There's something rather satisfying about looking down on the Houses of Parliament — or look the other way to clock Battersea Power Station. 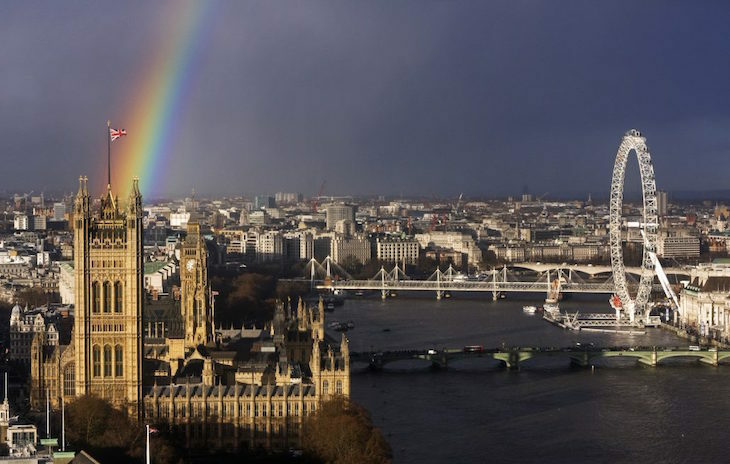 Aptly, the cocktail menu pays homage to the views, with each libation named after a London landmark visible from the bar (London Eye, Vauxhall Bridge, Chelsea Art School, to name but a few). A basic menu of food platters is available — pick from English, Italian or Lebanese. Everything's put together with visuals in mind at this art gallery — including the views from the 9th floor Restaurant. 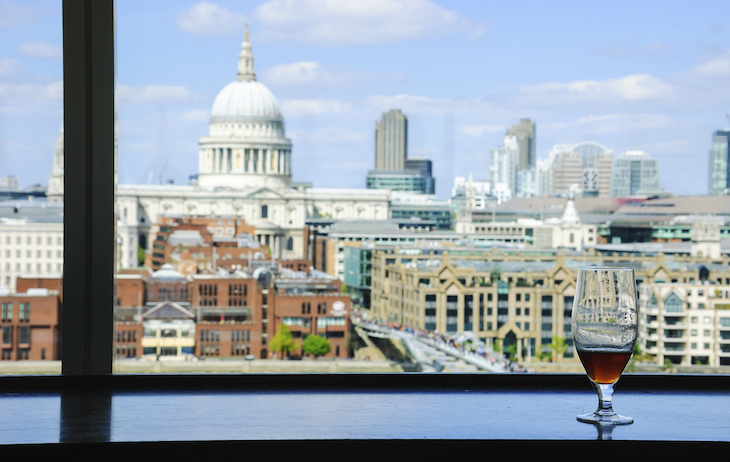 Despite its moniker, it's open to non-diners looking for refreshment in liquid form; coffee, beer, wine and stronger drinks — including an extensive range of gins — are served up with views northwards to St Paul's and east towards The Shard. This eighth floor Harvey Nichols-run venue is a restaurant, bar and brasserie in one. Its loftiness leaves something to be desired when compared to other watering holes on this list, but its Thameside location makes way for unparalleled panoramic views across — and up and down — the river. Sure, there's an open-air terrace, but if the weather's not on your side, try to blag a table next to the floor length windows and sup your way through the ever-changing cocktail menu. The classics are all present and correct, as are inventions by Oxo's own expert mixologists, and there's a decent alcohol-free selection too. Beer and cider are well represented, with predominantly British breweries being celebrated. Our tip? Treat yourself to a jar of the house-made pork crackling to crunch on — you won't regret it. This river-side upmarket bar was known as Rumpus Room until its 2018 rebrand saw it reborn as 12th Knot. 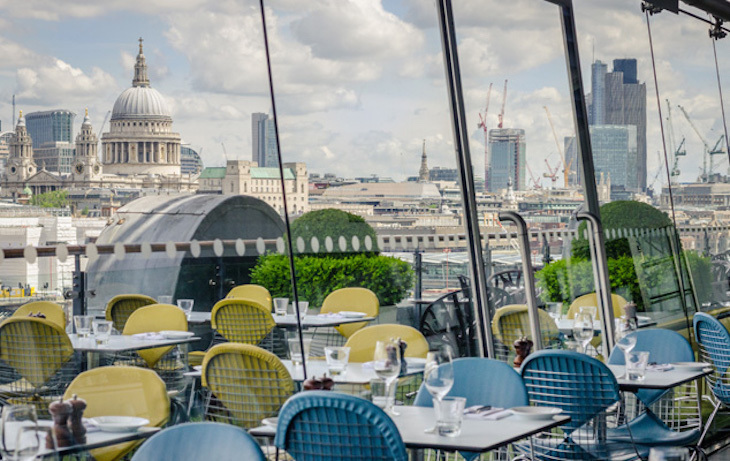 The views stretch right across the Thames towards St Paul's and the North Bank from pretty much any table in the venue. Seating is mainly smart-casual sofas and armchairs — or bar stools, if you want a front row view of your drinks being whipped up. If the weather is on your side, there's a balcony terrace. The cocktails are based on seasonal ingredients so change frequently, but the classics are a constant. Something of a lesser-known option is this stalwart, just north of Oxford Circus, where visitors are nose to spire with All Saints Langham Place church. If you don't mind your decor a little dated, you can get yourself a drink at The Heights Bar on the 15th floor of the St George's Hotel at a snip of the cost of other skyline venues, and still see for miles in a predominantly north-west direction. The good news for those not so keen on the booze is that The Heights is just as happy to serve you a cup of tea or a soft drink, and food options range from a scone with cream to a sirloin steak. This upmarket French restaurant offers slightly greener views than the urban skylines provided by other venues. 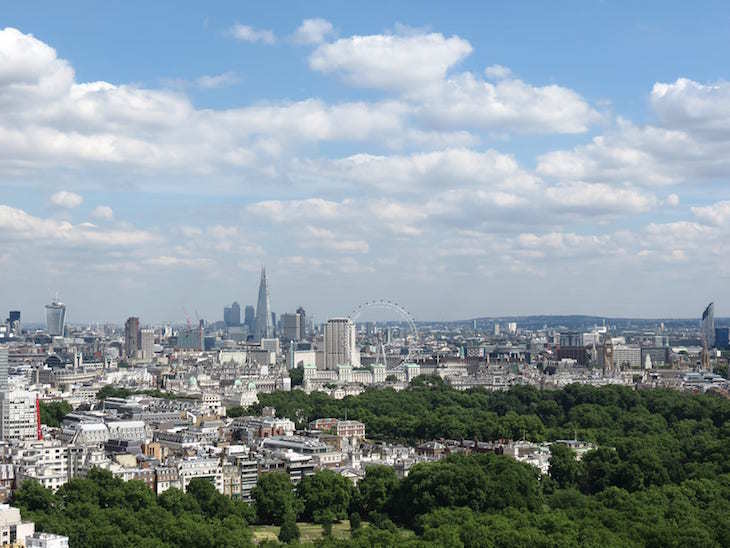 Galvin At Windows is located on the 28th floor of the Hilton Park Lane hotel, tantalisingly close to the south-east corner of Hyde Park, with Green Park to the south, and St James's Park beyond that. Signature cocktails, and low and no-alcohol variations are the bar's speciality, with prices starting at £16 for a boozy serve, and going up to £1,500 for a bottle of champagne. Whisky and gin are well represented, with myriad incarnations of each available from all over the world. Burgers, salads, soups and olives all feature on the substantial bar menu — in fact, we'd be tempted to blow off the restaurant entirely and enjoy the view with a cocktail and a burger, Mayfair stretched out like a toy town below.